In the New Testament, Jesus sometimes used parables to illustrate a concept or lesson in order to help people understand what he was teaching them. In a lot of ways, the art that we do in church is sometimes meant to act somewhat like a parable. It is meant to illustrate a concept in an engaging and meaningful way. 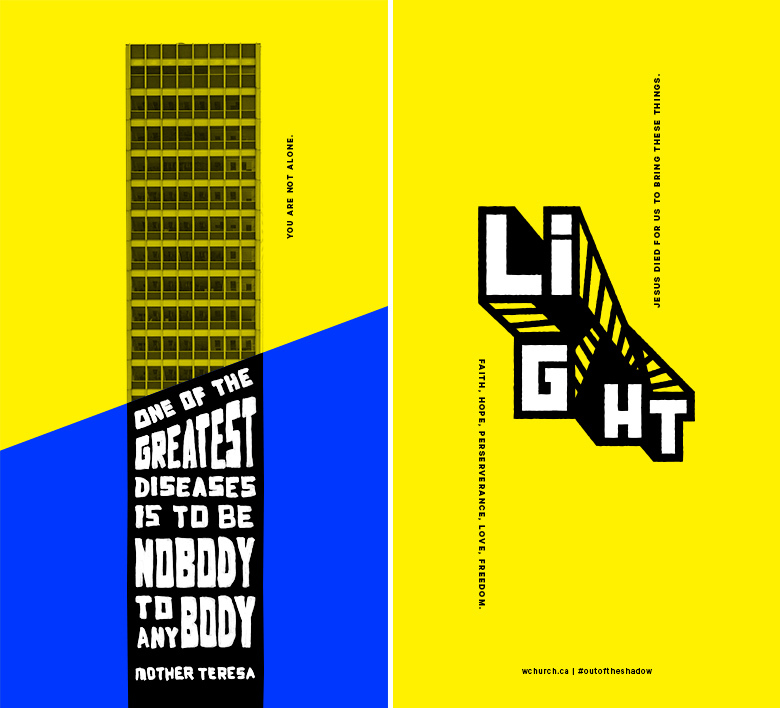 A way that people understand and relate to, helping to illuminate and solidify the message that has been given. 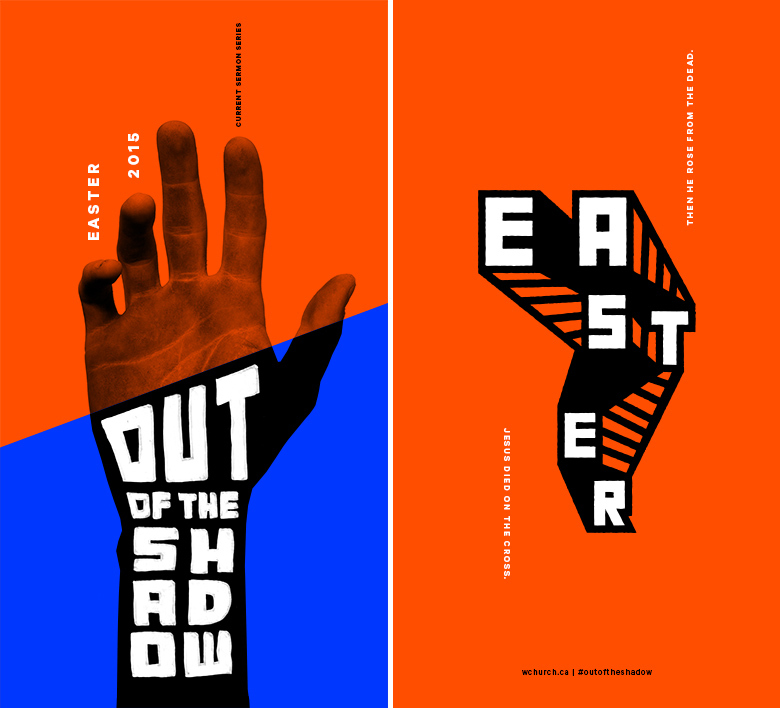 As we prepared the art for the sermon series on the resurrection leading up to Easter, we asked ourselves the question, “How does the cross and resurrection, the gospel, affect everything in this day, this city, and all the things that we struggle with?” After considering this question, we arrived at the concept of ‘Out of the Shadow’. “Why?” you ask? Because the story of the gospel is the story of Jesus conquering everything that stood between us and God and ultimately destroying the shadow of death! The things that we all struggle with today are the very real symptoms of a much larger problem. Our struggles are a result of the fall, a result of sin and death entering the world. Before Jesus came, sin and death were like a giant shadow casting darkness on all of mankind, but when Jesus came, died on the cross and rose again, he took on and conquered our sin and death once and for all! He broke through the darkness and shone a bright light on all of our struggles, giving us the opportunity to walk in freedom from those things if we would simply take up our cross and follow him! But the shadow of death doesn’t only include the moment we draw our final breath. No, we all experience it, to a certain extent, in our day to day lives. Many of the things we struggle with evidence the reality that we are still living in the shadow. They leave us in darkness and hinder us from thriving. It’s hard to see joy when in a shadow, and as a young person living in Vancouver, I realized that some struggles seemed to be extremely common amongst all of us in our city. 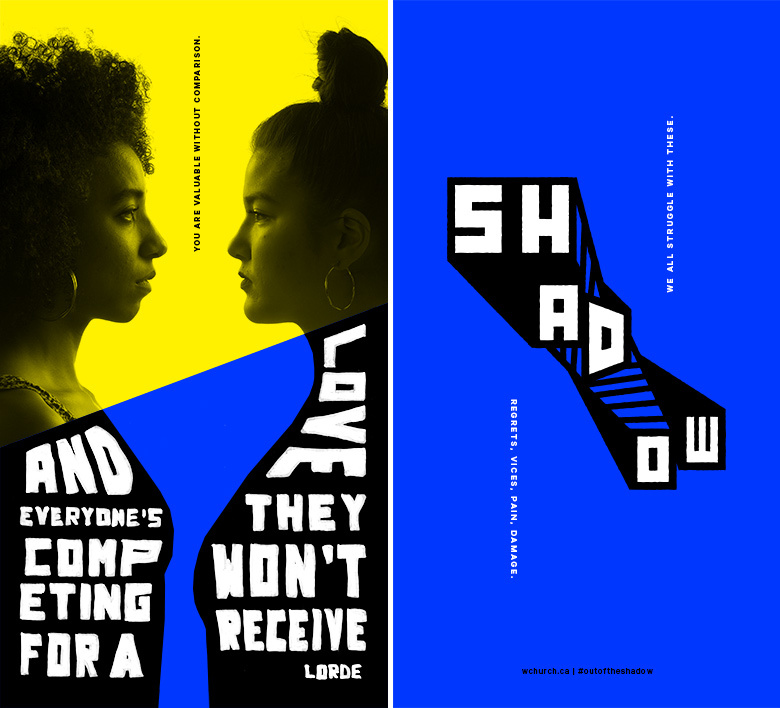 There are obviously many more than this, but I will just list the three easily discernable symptoms of “living in the shadow” that we ended up highlighting in the artwork for this series. A lot of my friends, myself included, often talk about struggling with comparison. In a day and age where social media is ever at our fingertips and allows us to create images that make everything seem awesome and attractive, this is a very real struggle. In our city this is also very apparent in the day to day. We are conscious of brands that people are wearing, successes they have, places they travel to, things they own, you name it. Living in a city seems to amplify the comparison of our lives to others. Maybe it’s because we’re in such close proximity to each other, I’m not really sure, but it’s definitely a problem. We are a culture that worships the clock and our success; success that we measure by how thick our wallets are. I don’t know about you, but it always seems like I’m in a rush. I have to get to the next thing and slowing down to stop and chat with a stranger is out of the question. That’s how we feel a lot of the time isn’t it? Because time is money and we need to be productive. But even more than this, we feel the distinct pressure to make enough money for a certain type of life that we are supposed to have and if you don’t have it, well… you’re a failure. We live in a city that is extremely expensive and every day feels like a battle to stay afloat for most, yet we can see the affluence on the street daily and feel like we need to keep up. If I just work harder, if I put all my time into my job, then I will achieve success and then I’ll be satisfied. But at what cost? 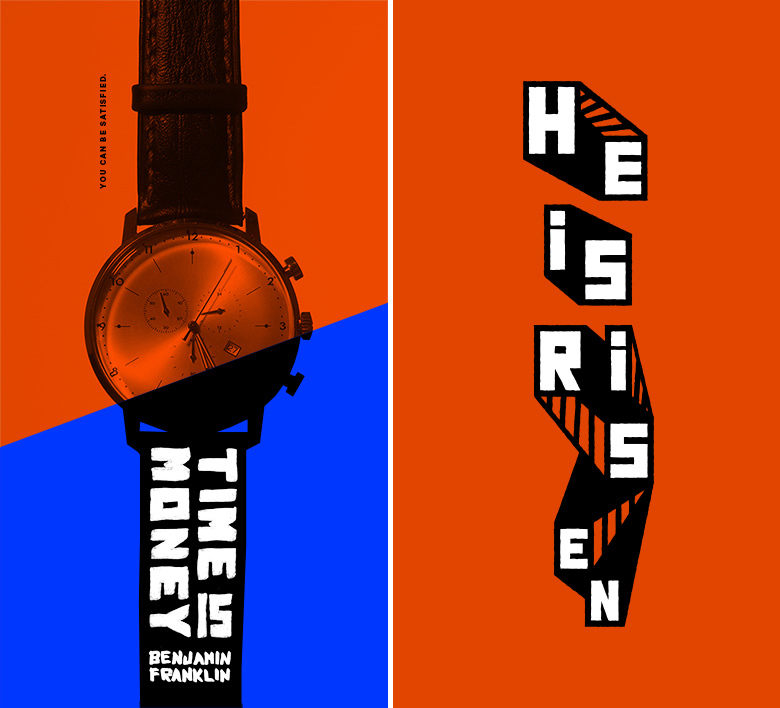 Time and money. We worry about both of these things and struggle with them deeply. Our city screams it at us everyday, “Money is security! If you had more money you wouldn’t be so worried!” Yet it’s never really enough is it? We always need more money and more time, leaving us unsatisfied and frustrated. Vancouverites are highly independent. We are self-made people who can make it on our own…but can we? The amount of people living alone in the downtown core is staggering, and while living on your own in and of itself can be a great thing, a lot of people don’t have a community to speak of. The truth is that being on your own can feel like an overwhelming burden sometimes, especially when hard circumstances come your way or you need help. When we’re lonely, we question if we’re worth being loved. Doesn’t anyone know that I exist? Doesn’t anyone care? Or how about those of us who may have many people around us, but still feel alone? Misunderstood? Expendable? We all know that you don’t have to be physically alone to feel lonely, but where does that come from? And doesn’t loneliness always seem to say something about our value? Or rather lack of value? We have all felt lonely before and I always find it interesting that in a city of over a million people, that feeling isn’t quieted, it’s amplified. These are some of the struggles we live with, but these are only symptoms of the great struggle that Jesus came to conquer. In the light of Christ, we don’t have to live in a constant state of comparison. In Jesus we have experienced a love without comparison through the His death and resurrection! We have been created uniquely and can be perfected only in Christ. In the light of Christ, we don’t have to chase time and money hoping that they’ll bring satisfaction, because in Christ we are fully satisfied. He has given us everything we need and has loved us with an everlasting love. In the light of Christ, we don’t have to be lonely, because Christ died for people like US. He loved us SO much, that he gave his life to pay for our debts. He is always with those who put their faith in him and will never forsake them. In Jesus we are never alone. This is what we need to get: the gospel, the cross, the resurrection, changes EVERYTHING. Right here, in our city, in this day and age as you go to work or have coffee or take care of your kids. When we look at life through the lens of the gospel, it completely changes our entire lives and the way we live! It offers joy even in the midst of hard circumstances! We don’t have to live in the shadow, because the resurrection allows us to live in the light of Christ instead! There is freedom and joy in Jesus, ready for the taking! All we need to do is see ourselves, see the shadow of sin and death and then see our great Savior who lived, died, and rose to destroy it! 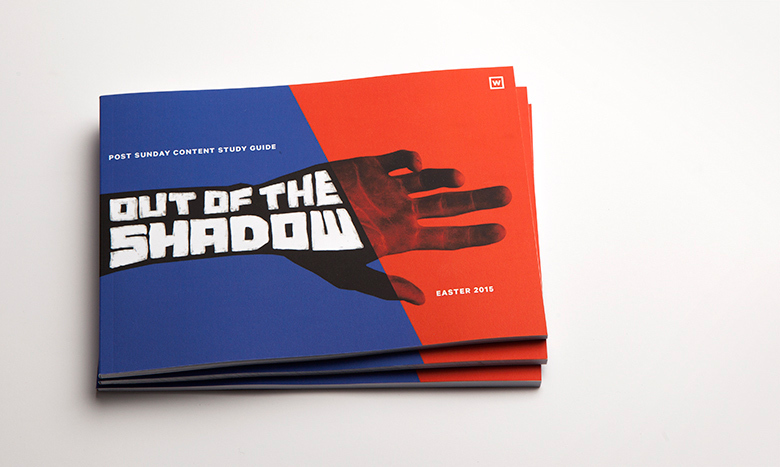 You can listen to the single 'Out of the Shadow' written for the series here. Creative Team: Tiffany Haines (concept, creative direction and design), Rob Trendiak (photography), and Ryan Schroeder, Della Orrey and Natasha Belonio (series models).